Regulation (EC) No .../2004 of the European Parliament and of the Council (4) lays down general hygiene rules applying to all foodstuffs and Regulation (EC) No .../2004 of the European Parliament and of the Council (5) lays down specific hygiene rules for products of animal origin. Specific rules for official controls on products of animal origin are necessary to take account of specific aspects associated with such products. The scope of the specific control rules should mirror the scope of the specific hygiene rules for food business operators laid down in Regulation (EC) No.../2004 (6). However, Member States should also carry out appropriate official controls to enforce national rules established in accordance with Article 1(4) of that Regulation. They may do so by extending the principles of this Regulation to such national rules. Official controls on products of animal origin should cover all aspects that are important for protecting public health and, where appropriate, animal health and animal welfare. They should be based on the most recent relevant information available and it should therefore be possible to adapt them as relevant new information becomes available. Community legislation on food safety should have a sound scientific basis. To that end, the European Food Safety Authority should be consulted whenever necessary. The nature and intensity of the official controls should be based on an assessment of public health risks, animal health and welfare, where appropriate, the type and throughput of the processes carried out and the food business operator concerned. It is appropriate to provide for the adaptation of certain specific control rules, through the transparent procedure provided for in Regulation (EC) No .../2004 (7) and Regulation (EC) No .../2004 (8), to provide flexibility in order to accommodate the specific needs of establishments which use traditional methods, have a low throughput or are located in regions that are subject to special geographical constraints. The procedure should also allow pilot projects to take place in order to try out new approaches to hygiene controls on meat. However, such flexibility should not compromise food hygiene objectives. Official controls on the production of meat are necessary to verify that food business operators comply with hygiene rules and respect criteria and targets laid down in Community legislation. These official controls should comprise audits of food business operators' activities and inspections, including checks on food business operators' own controls. In view of their specific expertise, it is appropriate for official veterinarians to carry out audits and inspections of slaughterhouses, game handling establishments and certain cutting plants. Member States should have discretion to decide which are the most appropriate staff for audits and inspections of other types of establishments. Official controls on the production of live bivalve molluscs and on fishery products are necessary to check for compliance with the criteria and targets laid down in Community legislation. Official controls on the production of live bivalve molluscs should in particular target relaying and production areas for bivalve molluscs and the end product. Official controls on the production of raw milk are necessary to check for compliance with criteria and targets laid down in Community legislation. Such official controls should in particular target milk production holdings and raw milk upon collection. The requirements of this Regulation should not apply until all parts of the new legislation on food hygiene have entered into force. It is also appropriate to provide for at least 18 months to elapse between entry into force and the application of the new rules, to allow competent authorities and the industries affected time to adapt. 1. This Regulation lays down specific rules for the organisation of official controls on products of animal origin. 2. It shall apply only in respect of activities and persons to which Regulation (EC) No .../2004 (10) applies. 3. The performance of official controls pursuant to this Regulation shall be without prejudice to food business operators' primary legal responsibility for ensuring food safety, as laid down in Regulation (EC) No 178/2002 of the European Parliament and of the Council, of 28 January 2002 laying down the general principles and requirements of food law, establishing the European Food Safety Authority, and laying down procedures in matters of food safety (11), and any civil or criminal liability arising from the breach of their obligations. "health mark" means a mark indicating that, when it was applied, official controls had been carried out in accordance with this Regulation. Regulation (EC) No .../2004 (14). When Community legislation requires the approval of establishments, the competent authority shall make an on-site visit. It shall approve an establishment for the activities concerned only if the food business operator has demonstrated that it meets the relevant requirements of Regulations (EC) No .../2004 (15) and No .../2004 (16) and other relevant requirements of food law. The competent authority may grant conditional approval if it appears from the on-site visit that the establishment meets all the infrastructure and equipment requirements. It shall grant full approval only if it appears from a new on-site visit carried out within three months of the granting of conditional approval that the establishment meets the other requirements referred to in (a). If clear progress has been made but the establishment still does not meet all of these requirements, the competent authority may prolong conditional approval. However, conditional approval shall not exceed a total of six months. 2. In the case of factory and freezer vessels flying the flag of Member States, the maximum periods of three and six months applying to the conditional approval of other establishments may be extended, if necessary. However, conditional approval shall not exceed a total of 12 months. Inspections of such vessels shall take place as specified in Annex III. 3. The competent authority shall give each approved establishment, including those with conditional approval, an approval number, to which codes may be added to indicate the types of products of animal origin manufactured. For wholesale markets, secondary numbers indicating units or groups of units selling or manufacturing products of animal origin may be added to the approval number. The competent authority shall keep the approval of establishments under review when carrying out official controls in accordance with Articles 4 to 8. If the competent authority identifies serious deficiencies or has to stop production at an establishment repeatedly and the food business operator is not able to provide adequate guarantees regarding future production, the competent authority shall initiate procedures to withdraw the establishment's approval. However, the competent authority may suspend an establishment's approval if the food business operator can guarantee that it will resolve deficiencies within a reasonable time. In the case of wholesale markets, the competent authority may withdraw or suspend approval in respect of certain units or groups of units. to establishments already placing products of animal origin on the market but in respect of which there was previously no requirement for approval. In the latter case, the competent authority's on-site visit required under paragraph 1 shall take place as soon as possible. Paragraph 4 shall also apply to approved establishments that placed products of animal origin on the market in accordance with Community legislation immediately prior to the application of this Regulation. 6. Member States shall maintain up-to-date lists of approved establishments, with their respective approval numbers and other relevant information, and make them available to other Member States and to the public in a manner that may be specified in accordance with the procedure referred to in Article 19(2). make available any documentation and record required under the present regulation or considered necessary by the competent authority for judging the situation. any particular auditing tasks specified in the Annexes. controls on food entering and leaving the establishment and any accompanying documentation. do not contain physical hazards, such as foreign bodies. When, in accordance with Article 5 of Regulation (EC) No .../2004 (20), a food business operator uses procedures set out in guides to the application of HACCP principles rather than establishing its own specific procedures, the audit shall cover the correct use of these guides. 6. Verification of compliance with the requirements of Regulation (EC) No .../2004 (21) concerning the application of identification marks shall take place in all establishments approved in accordance with that Regulation, in addition to verification of compliance with other traceability requirements. 7. In the case of slaughterhouses, game handling establishments and cutting plants placing fresh meat on the market, an official veterinarian shall carry out the auditing tasks referred to in paragraphs 3 and 4.
to document elements taken into account and the findings of the audit. the food business operator's past record as regards compliance with food law. Member States shall ensure that official controls with respect to fresh meat take place in accordance with Annex I. The health marking of carcasses of domestic ungulates, farmed game mammals other than lagomorphs, and large wild game, as well as half-carcasses, quarters and cuts produced by cutting half-carcasses into three wholesale cuts, shall be carried out in slaughterhouses and game-handling establishments in accordance with Section I, Chapter III, of Annex I. Health marks shall be applied by, or under the responsibility of, the official veterinarian when official controls have not identified any deficiencies that would make the meat unfit for human consumption. Official auxiliaries may assist the official veterinarian with official controls carried out in accordance with Sections I and II of Annex I as specified in Section III, Chapter I. In that case, they shall work as part of an independent team. Member States shall ensure that they have sufficient official staff to carry out the official controls required under Annex I with the frequency specified in Section III, Chapter II. A risk-based approach shall be followed to assess the number of official staff that need to be present on the slaughter line in any given slaughterhouse. The number of official staff involved shall be decided by the competent authority and shall be such that all the requirements of this Regulation can be met. report any deficiency to the official veterinarian. Member States may also allow slaughterhouse staff to carry out specific sampling and testing tasks in accordance with Annex I, Section III, Chapter III, Part B. Member States shall ensure that official veterinarians and official auxiliaries are qualified and undergo training in accordance with Annex I, Section III, Chapter IV. Member States shall ensure that the production and placing on the market of live bivalve molluscs, live echinoderms, live tunicates and live marine gastropods undergo official controls as described in Annex II. Member States shall ensure that official controls with respect to fishery products take place in accordance with Annex III. Member States shall ensure that official controls with respect to raw milk and dairy products take place in accordance with Annex IV. 1. When the competent authority identifies non-compliance with the Regulations referred to in Article 4(2)(a) and (b), it shall take action to ensure that the food business operator remedies the situation. When deciding which action to take, the competent authority shall take account of the nature of the non-compliance and the food business operator's past record with regard to non-compliance. any other measure that the competent authority deems appropriate. information on rights of appeal against such decisions and of the applicable procedure and time limits. Where appropriate, the competent authority shall also notify the competent authority of the Member State of dispatch of its decision. To ensure the uniform application of the principles and conditions laid down in Article 11 of Regulation (EC) No 178/2002 the procedures laid down in this Chapter shall apply. 1. Products of animal origin shall be imported only from a third country or a part of third country that appears on a list drawn up and updated in accordance with the procedure referred to in Article 19(2). it is determined, when deciding to add a particular third country to a list in accordance with paragraph 1, that other information indicates that the competent authority provides the necessary guarantees. 3. Lists drawn up in accordance with this Article may be combined with other lists drawn up for public and animal health purposes. the existence, implementation and communication of an approved residue control programme. 5. The Commission shall arrange for up-to-date versions of all lists drawn up or updated in accordance with this Article to be available to the public. in the cases specified in Annex V.
In addition, fresh meat, minced meat, meat preparations, meat products and mechanically separated meat (MSM) may be imported into the Community only if they have been manufactured from meat obtained in slaughterhouses and cutting plants appearing on lists drawn up and updated in accordance with this Article or in approved Community establishments. it has real powers to stop the establishments from exporting to the Community in the event that the establishments fail to meet the requirements referred to under (a). 3. The competent authorities of third countries appearing on lists drawn up and updated in accordance with Article 11 shall guarantee that lists of the establishments referred to in paragraph 1 are drawn up, kept up-to-date and. communicated to the Commission. The Commission shall provide the contact points that Member States have designated for this purpose with regular notifications concerning new or updated lists that it has received from the competent authorities of third countries concerned in accordance with paragraph 3. If no Member State objects to the new or updated list within 20 working days of the Commission's notification, imports shall be authorised from establishments appearing on the list 10 working days after the day on which the Commission makes it available to the public. The Commission shall, whenever at least one Member State makes written comments, or whenever it considers that the modification of a list is necessary in the light of relevant information such as Community inspection reports or a notification under the rapid alert system, inform all Member States and include the point on agenda of the next meeting of the relevant section of the Standing Committee on the Food Chain and Animal Health for decision, where appropriate, in accordance with the procedure referred to in Article 19(2). 5. The Commission shall arrange for up-to-date versions of all lists to be available to the public. 1. Notwithstanding Article 12(1)(b), live bivalve molluscs, echinoderms, tunicates and marine gastropods shall come from production areas in third countries that appear on lists drawn up and updated in accordance with Article 12. 2. The requirement of paragraph 1 shall not apply to pectinidae harvested outside classified production areas. However, official controls with respect to pectinidae shall take place in accordance with Annex II, Chapter III. Before the lists referred to in paragraph 1 are drawn up, particular account shall be taken of the guarantees that the competent authority of the third country can give concerning compliance with the requirements of this Regulation on the classification and control of production zones. it is determined, when deciding to add a particular production area to a list in accordance with paragraph 1, that other information indicates that the competent authority provides the necessary guarantees. 4. The Commission shall arrange for up-to-date versions of all lists drawn up or updated in accordance with this Article to be available to the public. 1. A document meeting the requirements set out in Annex VI shall accompany consignments of products of animal origin when they are imported into the Community. any special import conditions established in accordance with Article 18, point 19. 3. Documents may include details required in accordance with other Community legislation on public and animal health matters. 4. Exemptions from paragraph 1 may be granted in accordance with the procedure referred to in Article 19(2) when it is possible to obtain the guarantees referred to in paragraph 2 of this Article in another manner. 1. The procedures laid down in this Chapter do not apply to fresh fishery products landed in the Community directly from a fishing vessel flying the flag of a third country. Official controls with respect to such fishery products shall take place in accordance with Annex III. Fishery products imported from a factory or freezer vessel flying the flag of a third country shall come from vessels that appear on a list drawn up and updated in accordance with the procedure set out in Article 12(4). the competent authority of that Member State has declared that it will regularly inspect the vessel to ensure that it continues to comply with Community requirements. The Commission shall arrange for up-to-date versions of all lists drawn up or updated in accordance with this Article to be available to the public. 3. When fishery products are imported directly from a fishing or freezer vessel, a document signed by the captain may replace the document required under Article 14. 4. Detailed rules for the implementation of this Article may be laid down in accordance with the procedure referred to in Article 19(2). Implementing measures and transitional arrangements may be laid down in accordance with the procedure referred to in Article 19(2). 1. Annexes I, II, III, IV, V and VI may be amended or supplemented to take account of scientific and technical progress in accordance with the procedure referred to in Article 19(2). 2. Exemptions from Annexes I, II, III, IV, V and VI may be granted in accordance with the procedure referred to in Article 19(2), provided that they do not affect the achievement of the objectives of this Regulation. 3. Member States may, without compromising achievement of the objectives of this Regulation, adopt, in accordance with paragraphs 4 to 7, national measures adapting the requirements laid down in Annex I.
the presence of the competent authority in establishments. 6. The other Member States shall have three months from the receipt of a notification referred to in paragraph 5 to send written comments to the Commission. The Commission may, and when it receives written comments from one or more Member States shall, consult Member. States within the committee referred to in Article 19(1). The Commission may decide, in accordance with the procedure referred to in Article 19(2), whether the envisaged measures may be implemented subject, if necessary, to appropriate amendments. Where appropriate, the Commission may propose general measures in accordance with paragraphs 1 or 2 of this Article. if, one month after the expiry of the period referred to in paragraph 6, the Commission has not informed Member States that it has received written comments or that it intends to propose the adoption of a decision in accordance with paragraph 6. 8. When a Member State adopts national measures implementing a pilot project to try out new approaches to hygiene controls on meat in accordance with paragraphs 3 to 7, the Member State shall communicate the results to the Commission as soon as they are available. The Commission shall then consider proposing general measures in accordance with paragraph 1.
the conditions governing imports of products of animal origin from a third country or a region of a third country pursuant to the implementation of an equivalence agreement, or to a satisfactory audit, recognising that measures applied in that third country or region offer guarantees equivalent to those applied in the Community, if the third country supplies objective proof in this respect. 1. The Commission shall be assisted by the Standing Committee on the Food Chain and Animal Health instituted by Article 58 of Regulation (EC) No 178/2002. before proposing implementing measures on the matters referred to in Article 18, points (5) to (15). 1. The Commission shall, not later than ..., (25) submit a report to the European Parliament and the Council reviewing the experience gained from the application of this Regulation. This Regulation shall enter into force twenty days after the date of its publication in the Official Journal of the European Union. Directive 2004/.../EC of the European Parliament and of the Council of repealing certain Directives concerning food hygiene and health conditions for the production and placing on the market of certain products of animal origin intended for human consumption (28). (1) OJ C 262 E, 29.10.2002, p. 449. (2) OJ C 95, 23.4.2003, p. 22. (3) Opinion of the European Parliament of 5 June 2003 (not yet published in the Official Journal), Council Common Position of 27 October 2003 (OJ C 48 E, 24.2.2004, p. 82), Position of the European Parliament of 30 March 2004 (not yet published in the Official Journal) and Council Decision of 16 April 2004. (4) Page ... of this Official Journal. (5) Page ... of this Official Journal. (6) Note for the Official Journal: insert number of Regulation laying down specific hygiene rules for food of animal origin (see recital 1, 2nd Regulation). (7) Note for the Official Journal: insert number of Regulation on the hygiene of foodstuffs (see recital 1, 1st Regulation). (8) Note for the Official Journal: insert number of Regulation laying down specific hygiene rules for food of animal origin (see recital 1, 2nd Regulation). (9) OJ L 184, 17.7.1999, p. 23. (10) Note for the OJ: insert number of Regulation laying down specific hygiene rules for food of animal origin (see recital 1, 2nd Regulation). (11) OJ L 31, 1.2.2002, p. 1. Regulation as last amended by Regulation (EC) No 1642/2003 (OJ L 245, 29.9.2003, p.4). (12) OJ L 273, 10.10.2002, p. 1. Regulation as last amended by Commission Regulation (EC) No 813/2003 (OJ L 117, 13.5.2003, p. 22). (13) Note for the Official Journal: insert number of Regulation on the hygiene of foodstuffs (see recital 1, 1st Regulation). (14) Note for the Official Journal: insert number of Regulation laying down specific hygiene rules for food of animal origin (see recital 1, 2nd Regulation). (15) Note for the Official Journal: insert number of Regulation on the hygiene of foodstuffs (see recital 1, 1st Regulation). (16) Note for the Official Journal: insert number of Regulation laying down specific hygiene rules for food of animal origin (see recital 1, 2nd Regulation). (17) Note for the Official Journal: insert number of Regulation on the hygiene of foodstuffs (see recital 1, 1st Regulation). (18) Note for the Official Journal: insert number of Regulation laying down specific hygiene rules for food of animal origin (see recital 1, 2nd Regulation). (19) Note for the Official Journal: insert number of Regulation laying down specific hygiene rules for food of animal origin (see recital 1, 2nd Regulation). (20) Note for the Official Journal: insert number of Regulation on the hygiene of foodstuffs (see recital 1, 1st Regulation). (21) Note for the Official Journal: insert number of the Regulation laying down specific hygiene rules for food of animal origin (see recital 1,2nd Regulation). (22) Note for the OJ: insert number of Regulation laying down specific hygiene rules for food of animal origin (see recital 1, 2nd Regulation). (23) Note for the OJ: insert number of Regulation on the hygiene of foodstuffs (see recital 1, 1st Regulation). (24) Note for the OJ: insert number of Regulation laying down specific hygiene rules for food of animal origin (see recital 1, 2nd Regulation). (25) Five years after the entry into force of this Regulation. (26) Note for the Official Journal: insert number of Regulation on the hygiene of foodstuffs (see recital 1, 1st Regulation). (27) Note for the Official Journal: insert number of Regulation laying down specific hygiene rules for food of animal origin (see recital 1, 2nd Regulation). (28) See p. of this Official Journal. In addition to the general requirements of Article 4(4) concerning audits of good hygiene practices, the official veterinarian is to verify continuous compliance with food business operators' own procedures concerning any collection, transport, storage, handling, processing and use or disposal of animal by-products, including specified risk material, for which the food business operator is responsible. does not contain specified risk material, except as provided for under Community legislation, and has been produced in accordance with Community legislation on TSEs. When carrying out inspection tasks in accordance with this Chapter, the official veterinarian is to take account of the results of the auditing tasks carried out in accordance with Article 4 and Chapter I of this Annex. Where appropriate he or she is to target inspection tasks accordingly. The official veterinarian is to check and analyse relevant information from the records of the holding of provenance of animals intended for slaughter and to take account of the documented results of this check and analysis when carrying out ante- and post-mortem inspection. When carrying out inspection tasks, the official veterinarian is to take account of official certificates accompanying animals, and any declarations made by veterinarians carrying out controls at the level of primary production, including official veterinarians and approved veterinarians. When food business operators in the food chain take additional measures to guarantee food safety by implementing integrated systems, private control systems, independent third party certification or by other means, and when these measures are documented and animals covered by these schemes clearly identifiable, the official veterinarian may take this into account when carrying out inspection tasks and reviewing the HACCP-based procedures. that inspection must take place within 24 hours of arrival at the slaughterhouse and less than 24 hours before slaughter. In addition, the official veterinarian may require inspection at any other time. of any condition which might adversely affect human or animal health, paying particular attention to the detection of zoonotic diseases and diseases on List A or, where appropriate, List B of the Office International des Epizooties (World organisation for animal health, OIE). In addition to routine ante-mortem inspection, the official veterinarian is to carry out a clinical inspection of all animals that the food business operator or an official auxiliary may have put aside. In the case of emergency slaughter outside the slaughterhouse and of hunted wild game, the official veterinarian at the slaughterhouse or game handling establishment is to examine the declaration accompanying the body of the animal issued by the veterinarian or the trained person in accordance with Regulation (EC) No .../2004 (1). Where provided for in Section III, Chapter II, or in Section IV, ante-mortem inspection may be carried out at the holding of provenance. In such cases, the official veterinarian at the slaughterhouse need carry out ante-mortem inspection only when and to the extent specified. The official veterinarian is to verify compliance with relevant Community and national rules on animal welfare, such as rules concerning the protection of animals at the time of slaughter and during transport. Carcases and accompanying offal are to be subjected without delay after slaughter to post-mortem inspection. All external surfaces are to be viewed. Minimal handling of the carcase and offal or special technical facilities may be required for that purpose. Particular attention is to be paid to the detection of zoonotic diseases and diseases on OIE List A and, where appropriate, OIE List B. The speed of the slaughter line and the number of inspection staff present are to be such as to allow for proper inspection. particularly in the case of animals having undergone emergency slaughter. The official veterinarian is to require carcases of domestic solipeds, bovine animals over six months old, and domestic swine over four weeks old to be submitted for post-mortem inspection split lengthways into half carcases down the spinal column. If the inspection so necessitates, the official veterinarian may also require any head or any carcase to be split lengthways. However, to take account of particular eating habits, technological developments or specific sanitary situations, the competent authority may authorise the submission for inspection of carcases of domestic solipeds, bovine animals over six months old, and domestic swine over four weeks old, not split in half. During the inspection, precautions must be taken to ensure that contamination of the meat by actions such as palpation, cutting or incision is kept to a minimum. In the event of an emergency slaughter, the carcass shall be subjected to post-mortem examination as soon as possible in accordance with paragraphs 1 to 4 before it is released for human consumption. In accordance with specific Community rules on specified risk material and other animal by-products, the official veterinarian is to check the removal, separation and, where appropriate, marking of such products. The official veterinarian is to ensure that the food business operator takes all necessary measures to avoid contaminating meat with specified risk material during slaughter (including stunning) and removal of specified risk material. the detection of OIE List A and, where appropriate, OIE List B diseases. The official veterinarian is also to ensure that any other necessary laboratory testing takes place. The official veterinarian is to supervise health marking and the marks used. health-marking takes place on the external surface of the carcase, by stamping the mark in ink or hot branding, and in such a manner that, if carcases are cut into half carcases or quarters, or half carcases are cut into three pieces, each piece bears a health mark. the mark must indicate name of the country in which the establishment is located, which may be written out in full in capitals or shown as a two-letter code in accordance with the relevant ISO standard. when applied in a slaughterhouse within the Community, the mark must include the abbreviation CE, EC, EF, EG, EK or EY. Letters must be at least 0,8 cm high and figures at least 1 cm high. The dimensions and characters of the mark may be reduced for health marking of lamb, kids and piglets. The colours used for health marking must be authorised in accordance with Community rules on the use of colouring substances in foodstuffs. The health mark may also include an indication of the official veterinarian who carried out the health inspection of the meat. Competent authorities and food business operators may continue to use equipment that they ordered before entry into force of this Regulation until it is exhausted or requires replacement. Meat from animals having undergone emergency slaughter outside the slaughterhouse must bear a special health mark, which cannot be confused either with the health mark provided for in this Chapter or with the identification mark provided for in Annex II, Section I, to Regulation (EC) No .../2004 (4). Meat from unskinned wild game cannot bear a health mark unless, after skinning in a game handling establishment, it has undergone post-mortem inspection and been declared fit for human consumption. This Chapter is to apply without prejudice to animal health rules on health marking. The official veterinarian is to record and to evaluate the results of inspection activities. If inspections reveal the presence of any disease or condition that might affect public or animal health, or compromise animal welfare, the official veterinarian is to inform the food business operator. When the problem identified arose during primary production, the official veterinarian is to inform the veterinarian attending the holding of provenance, the food business operator responsible for the holding of provenance (provided that such information would not prejudice subsequent legal proceedings) and, where appropriate, the competent authority responsible for supervising the holding of provenance or the hunting area. If the animals concerned were raised in another Member State or in a third country, the official veterinarian is to inform to the competent authority of the Member State where the establishment is located. That competent authority is to take appropriate measures in accordance with applicable Community legislation. The results of inspections and tests are to be included in relevant databases. When the official veterinarian, while carrying out ante-mortem or post-mortem inspection or any other inspection activity, suspects the presence of an infectious agent mentioned on OLE List A or, where appropriate, OLE List B, the official veterinarian must immediately notify the competent authority and both must take all necessary measures and precautions to prevent the possible spread of the infectious agent in accordance with applicable Community legislation. The official veterinarian is to verify that animals are not slaughtered unless the slaughterhouse operator has been provided with and checked relevant food chain information. However, the official veterinarian may allow animals to undergo slaughter in the slaughterhouse even if the relevant food chain information is not available. In this case, all relevant food chain information must be supplied before the carcase is approved for human consumption. Pending a final judgement, such carcases and related offal must be stored separately from other meat. Notwithstanding paragraph 2, when relevant food chain information is not available within 24 hours of an animal's arrival at the slaughterhouse, all meat from the animal is to be declared unfit for human consumption. If the animal has not yet been slaughtered, it is to be killed separately from other animals. any other condition which might adversely affect human or animal health is present, animals may not be accepted for slaughter other than in accordance with procedures laid down under Community legislation to eliminate human or animal health risks. If the animals are already present at the slaughterhouse, they must be killed separately and declared unfit for human consumption, taking precautions to safeguard animal and public health where appropriate. Whenever the official veterinarian considers it necessary, official controls are to be carried out on the holding of provenance. The competent authority is to take appropriate action if it discovers that the accompanying records, documentation or other information do not correspond with the true situation on the holding of provenance or the true condition of the animals or aim deliberately to mislead the official veterinarian. The competent authority is to take action against the food business operator responsible for the holding of provenance of the animals, or any other person involved. This action may consist in particular of extra controls. The food business operator responsible for the holding of provenance or any other person involved are to bear the costs of such extra controls. The official veterinarian is to verify compliance with the food business operator's duty under Regulation (EC) No .../2004 (5) to ensure that animals accepted for slaughter for human consumption are properly identified. The official veterinarian is to ensure that animals whose identity is not reasonably ascertainable are killed separately and declared unfit for human consumption. Whenever the official veterinarian considers it necessary, official controls are to be carried out on the holding of provenance. When there are overriding animal welfare considerations, horses may undergo slaughter at the slaughterhouse even if the legally required information concerning their identity has not been supplied. However, this information must be supplied before the carcase may be declared fit for human consumption. These requirements also apply in the case of emergency slaughter of horses outside the slaughterhouse. The official veterinarian is to verify compliance with the food business operator's duty under Regulation (EC) No .../2004 to ensure that animals that have such hide, skin or fleece conditions that there is an unacceptable risk of contamination of the meat during slaughter are not slaughtered for human consumption unless they are cleaned beforehand. Animals with a disease or condition that may be transmitted to animals or humans through handling or eating meat and, in general, animals showing clinical signs of systemic disease or emaciation, are not to be slaughtered for human consumption. Such animals must be killed separately, under conditions such that other animals or carcases can not be contaminated, and declared unfit for human consumption. The slaughter of animals suspected of having a disease or condition that may adversely affect human or animal health is to be deferred. Such animals are to undergo detailed ante-mortem examination in order to make a diagnosis. In addition, the official veterinarian may decide that sampling and laboratory examinations are to take place to supplement post-mortem inspection. If necessary, the animals are to be slaughtered separately or at the end of normal slaughtering, taking all necessary precautions to avoid contamination of other meat. Animals that might contain residues of veterinary medicinal products in excess of the levels laid down in accordance with Community legislation, or residues of forbidden substances, are to be dealt with in accordance with Directive 96/23/EC. The official veterinarian is to impose the conditions under which animals are to be dealt with under a specific scheme for the eradication or control of a specific disease, such as brucellosis or tuberculosis, or zoonotic agents such as salmonella, under his/her direct supervision. The competent authority is to determine the conditions under which such animals may be slaughtered. These conditions must have the aim of minimising contamination of other animals and the meat of other animals. Animals that are presented to a slaughterhouse for slaughter must as a general rule be slaughtered there. However, in exceptional circumstances, such as a serious breakdown of the slaughter facilities, the official veterinarian may allow direct movements to another slaughterhouse. When the rules concerning the protection of animals at the time of slaughter or killing are not respected, the official veterinarian is to verity that the food business operator immediately takes necessary corrective measures and prevents recurrence. The official veterinarian is to take a proportionate and progressive approach to enforcement action, ranging from issuing directions to slowing down and stopping production, depending on the nature and gravity of the problem. Where appropriate, the official veterinarian is to inform other competent authorities of welfare problems. When the official veterinarian discovers that rules concerning the protection of animals during transport are not being respected, he or she is to take necessary measures in accordance with the relevant Community legislation. the official auxiliary is immediately to inform the official veterinarian and, if necessary in cases of urgency, is to take the necessary measures referred to in paragraphs 1 to 4 pending the arrival of the official veterinarian. in the opinion of the official veterinarian, after examination of all the relevant information, it may constitute a risk to public or animal health or is for any other reason not suitable for human consumption. The official veterinarian may impose requirements concerning the use of meat derived from animals having undergone emergency slaughter outside the slaughterhouse. in relation to post-mortem inspection, the official veterinarian must regularly check the work of official auxiliaries and, in the case of animals having undergone emergency slaughter outside the slaughterhouse, carry out the inspection personally. in game handling establishments, throughout post-mortem inspection. the official auxiliary documents his/her procedures and findings in a manner that allows the official veterinarian to be satisfied that standards are being met. However, in the case of poultry and lagomorphs, the official auxiliary may discard meat with abnormalities and, subject to Section IV, the official veterinarian need not systematically inspect all such meat. when stricter controls are necessary to take account of emerging diseases or particular OIE List B diseases. In cutting plants, the competent authority is to ensure that an official veterinarian or an official auxiliary is present when meat is being worked on with a frequency appropriate to achieving the objectives of this Regulation. Where the establishment has used good hygiene practice in accordance with Article 4, paragraph 4 of this Regulation and the HACCP procedure for at least twelve months, the competent authority may authorise staff of the establishment who have been trained in the same way as the official assistants and have passed the same examination to carry out tasks of the official auxiliaries and form part of the competent authority's independent inspection team, under the supervision, direction and responsibility of the official veterinarian. In these circumstances, the official veterinarian shall be present at anti-mortem and post-mortem examinations, shall supervise these activities and carry out regular performance tests to ensure that the performance of the slaughterhouse tasks meets the specific criteria laid down by the competent authority, and shall document the results of those performance tests. Detailed rules for the performance tests shall be laid down in accordance with the procedure set out in Article 18. Where the level of hygiene of the establishment is affected by the work of this staff, where this staff does not carry out the tasks properly or where in general this staff carries out its work in a manner that the competent authority considers unsatisfactory, this staff shall be replaced by official auxiliaries. Responsibilities for production and inspection in the establishment must be kept separate and any establishment wishing to use the establishment's own inspectors must possess internationally recognised certification. The competent authority of the Member State shall decide, in principle and on a case-by-case basis, whether to permit the implementation of the system described above. Where the Member State decides in principle in favour of this system, it shall inform the Commission of that decision and its associated conditions. For food business operators in a Member State implementing the system, the actual use of the system is optional. Food business operators shall not be forced by the competent authority to introduce the system described here. Where the competent authority is not convinced that the food business operator satisfies the requirements, the system shall not be implemented in that establishment. In order to assess this, the competent authority shall carry out an analysis of the production and inspection records, the type of activities undertaken in the establishment, the history of compliance with rules, the expertise, professional attitude and sense of responsibility of the slaughterhouse staff in regard to food safety, together with other relevant information. Slaughterhouse staff who have received specific training, under the supervision of the official veterinarian, may, under the responsibility and the supervision of the official veterinarian, carry out specific sampling and testing tasks in respect of animals of all species. The competent authority may appoint only veterinarians who have passed a test meeting the requirements of paragraph 2 as official veterinarians. principles of training of personnel working in the production chain. Candidates may acquire the required knowledge as part of their basic veterinary training, or through training undertaken, or professional experience acquired, after qualifying as veterinarians. The competent authority may arrange for different tests to take account of candidates' background. However, when the competent authority is satisfied that a candidate has acquired all the required knowledge as part of a university degree, or through continuing education resulting in a post-graduate qualification, it may waive the requirement for a test. The veterinarian is to have aptitude for multidisciplinary cooperation. In addition, each official veterinarian is to undergo practical training for a probationary period of at least 200 hours before starting to work independently. During this period the probationer is to work under the supervision of existing official veterinarians in slaughterhouses, cutting plants, inspection posts for fresh meat and on holdings. The training is to concern the auditing of food safety management systems in particular. The official veterinarian is to maintain up-to-date knowledge and to keep abreast of new developments through regular continuing education activities and professional literature. The official veterinarian is, wherever possible, to undertake annual continuing education activities. Veterinarians already appointed as official veterinarians must have adequate knowledge of the subjects mentioned in paragraph 2. Where necessary, they are to acquire this knowledge through continuing education activities. The competent authority is to make adequate provision in this regard. The competent authority may appoint as official auxiliaries only persons who have undergone training and passed a test in accordance with the following requirements. such additional training as is required to enable official auxiliaries to undertake their duties competently. The practical training referred to in paragraph 2(a) is to take place in slaughterhouses and cutting plants, under the supervision of an official veterinarian, and on holdings and in other relevant establishments. Training and tests are to concern principally red meat or poultry meat. However, persons who undergo training for one of the two categories and passed the test, need only undergo abridged training to pass the test for the other category. Training and test should cover wild game, farmed game and lagomorphs, where appropriate. Official auxiliaries are to maintain up-to-date knowledge and to keep abreast of new developments through regular continuing education activities and professional literature. The official auxiliary is, wherever possible, to undertake annual continuing education activities. Persons already appointed as official auxiliaries must have adequate knowledge of the subjects mentioned in paragraph 5. Where necessary, they are to acquire this knowledge through continuing education activities. The competent authority is to make adequate provision in this regard. However, when official auxiliaries carry out only sampling and analysis in connection with examinations for trichinosis, the competent authority need only ensure that they receive training appropriate to these tasks. visual inspection and palpation of the umbilical region and the joints. In the event of doubt, the umbilical region must be incised and the joints opened; the synovial fluid must be examined. visual inspection and, if necessary, palpation and incision of the udder and its lymph nodes (Lnn. supramammarii). In cows, each half of the udder must be opened by a long, deep incision as far as the lactiferous sinuses (sinus lactiferes) and the lymph nodes of the udder must be incised, except when the udder is excluded from human consumption. visual inspection and palpation of the umbilical region and joints of young animals. In the event of doubt, the umbilical region must be incised and the joints opened; the synovial fluid must be examined. all grey or white horses must be inspected for melanosis and melanomata by examination of the muscles and lymph nodes ( Lnn. subrhomboidei) of the shoulders beneath the scapular cartilage after loosening the attachment of one shoulder. The kidneys must be exposed and examined by incision through the entire kidney. the requirements of paragraphs 2 to 5 are complied with. there is evidence or reasons to suspect that they may contain chemical residues in excess of the levels laid down in Community legislation, or residues of forbidden substances. An official veterinarian or an approved veterinarian is to carry out ante-mortem inspection at the holding. The pigs are to be sent directly to slaughter and not to be mixed with other pigs. a screening to ascertain whether animal welfare rules have been complied with and whether signs of any condition which might adversely affect human or animal health are present. An official auxiliary may carry out this screening. if the pigs are already en route for or at the slaughterhouse, slaughter may be authorised once the reason for the delay has been assessed, provided that the pigs undergo a further veterinary ante-mortem inspection. visual inspection and palpation of the umbilical region and joints of young animals; in the event of doubt, the umbilical region must be incised and the joints opened. The competent authority may decide, on the basis of epidemiological or other data from the holding, that fattening pigs housed under controlled housing conditions in integrated production systems since weaning need, in some or all of the cases referred to in paragraph 1, only undergo visual inspection. show evidence that they may contain chemical residues in excess of the levels laid down in Community legislation, or residues of forbidden substances. An official veterinarian or an approved veterinarian is to carry out ante-mortem inspection at the holding. if the flock is already en route for or at the slaughterhouse, slaughter may be authorised once the reason for the delay has been assessed, provided that the flock is re-examined. When ante-mortem inspection is not carried out at the holding, the official veterinarian is to carry out a flock inspection at the slaughterhouse. If the birds show clinical symptoms of a disease, they may not be slaughtered for human consumption. However, killing of these birds on the slaughter line may take place at the end of the normal slaughter process, if precautions are taken to avoid the risk of spreading pathogenic organisms and to clean and disinfect the facilities immediately after killing. In the case of poultry reared for the production of “foie gras” and delayed eviscerated poultry slaughtered at the holding of provenance, ante-mortem inspection is to be carried out in accordance with paragraphs 2 and 3. 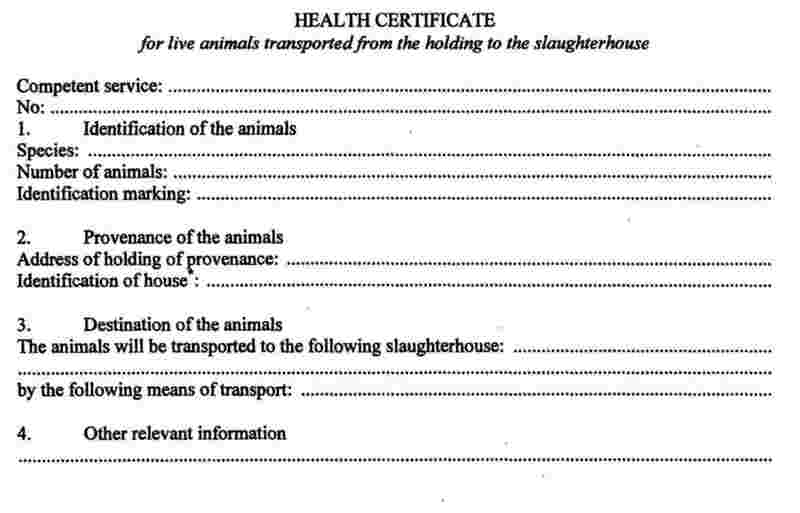 A certificate conforming to the model set out in Part C is to accompany the uneviscerated carcasses to the slaughterhouse or cutting plant. any further investigations necessary when there is reason to suspect that the meat from the birds concerned could be unfit for human consumption. 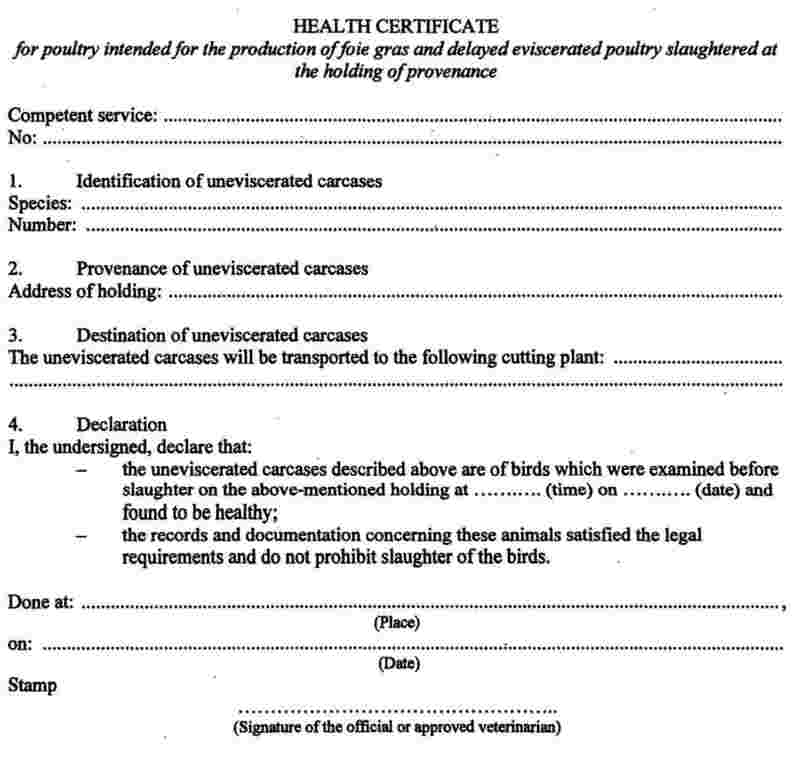 In the case of poultry reared for the production of “foie gras” and delayed eviscerated poultry obtained at the holding of provenance, post-mortem inspection is to include a check on the certificate accompanying the carcases. When such carcases are transported directly from the holding to a cutting plant, post-mortem inspection is to take place at the cutting plant. The requirements for poultry are to apply to farmed lagomorphs. Ante-mortem inspection may be carried out at the holding of provenance when the requirements of Annex III, Section III, to Regulation (EC) No .../2004 (8) are satisfied. In this case, an official veterinarian or an approved veterinarian is to carry out ante-mortem inspection. Ante-mortem inspection at the holding is to include checks on the records or documentation at the holding, including food chain information. a screening to ascertain whether animal welfare rules have been complied with and whether signs of any condition which might adversely affect human or animal health are present. A certificate conforming to the specimen in Chapter X, Part A, is to accompany live animals inspected at the holding. A certificate conforming to the specimen in Chapter X, Part B, is to accompany animals inspected and slaughtered at the holding. This inspection is to include palpation and, where judged necessary, incision of those parts of the animal which have undergone any change or are suspect for any other reason. Post-mortem inspection procedures described for bovine and ovine animals, domestic swine and poultry are to be applied to the corresponding species of farmed game. 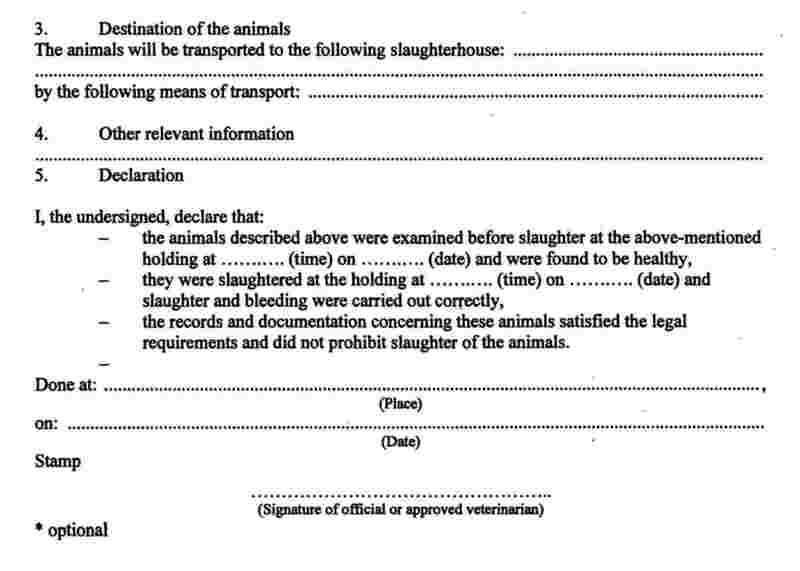 When the animals have been slaughtered at the holding, the official veterinarian at the slaughterhouse is to check the certificate accompanying them. Wild game is to be inspected as soon as possible after admission to the game handling establishment. The official veterinarian is to take account of the declaration or information that the trained person involved in hunting the animal has provided in accordance with Regulation (EC) No .../2004 (9). checking that death was not caused by reasons other than hunting. Where the official veterinarian so requires, the vertebral column and the head are to be split lengthwise. In the case of small wild game not eviscerated immediately after killing, the official veterinarian is to carry out a post-mortem inspection on a representative sample of animals from the same source. Where inspection reveals a disease transmissible to man or any of the characteristics listed in paragraph 3(e), the official veterinarian is to carry out more checks on the entire batch to determine whether it must be declared unfit for human consumption or whether each carcase must be inspected individually. In the event of doubt, the official veterinarian may perform any further cuts and inspections of the relevant parts of the animals necessary to reach a final diagnosis. In addition to the cases provided for in Section II, Chapter V, meat presenting during post-mortem inspection any of the characteristics listed in paragraph 3(e) of Part A are to be declared unfit for human consumption. Official controls carried out in relation to TSEs are to take account of the requirements of Regulation (EC) No 999/2001 and other relevant Community legislation. The post-mortem inspection procedures described in Chapters I and IV are the minimum requirements for the examination for cysticercosis in bovine animals over 6 weeks old and swine. In addition, specific serological tests may be used. In the case of bovines over 6 weeks old, incision of the masseters at post-mortem inspection is not compulsory when a specific serological test is used. The same applies when bovine animals over 6 weeks old have been raised on a holding officially certified to be free of cysticercosis. Meat infected with cysticercus is to be declared unfit for human consumption. However, when the animal is not generally infected with cysticercus, the parts not infected may be declared fit for human consumption after having undergone a cold treatment. Carcases of swine (domestic, farmed game and wild game), solipeds and other species susceptible to trichinosis are to be examined for trichinosis in accordance with applicable Community legislation, unless that legislation provides otherwise. Meat from animals infected with trichinae is to be declared unfit for human consumption. Where appropriate, solipeds are to be examined for glanders. Examination for glanders in solipeds is to include a careful examination of mucous membranes from the trachea, larynx, nasal cavities and sinuses and their ramifications, after splitting the head in the median plane and excising the nasal septum. Meat from horses in which glanders has been diagnosed are to be declared unfit for human consumption. When animals have reacted positively or inconclusively to tuberculin, or there are other grounds for suspecting infection, they are to be slaughtered separately from other animals, taking precautions to avoid the risk of contamination of other carcases, the slaughter line and staff present in the slaughterhouse. All meat from animals in which post-mortem inspection has revealed localised tuberculous lesions in a number of organs or a number of areas of the carcase is to be declared unfit for human consumption. However, when a tuberculous lesion has been found in the lymph nodes of only one organ or part of the carcase, only the affected organ or part of the carcase and the associated lymph nodes need be declared unfit for human consumption. When animals have reacted positively or inconclusively to a brucellosis test, or there are other grounds for suspecting infection, they are to be slaughtered separately from other animals, taking precautions to avoid the risk of contamination of other carcases, the slaughter line and staff present in the slaughterhouse. Meat from animals in which post mortem inspection has revealed lesions indicating acute infection with brucellosis is to be declared unfit for human consumption. In the case of animals reacting positively or inconclusively to a brucellosis test, the udder, genital tract and blood must be declared unfit for human consumption even if no such lesion is found. (1) Note for Official Journal: Insert No of Regulation laying down specific hygiene rules for food of animal origin (see recital 1, 2nd Regulation). (2) OJ L 147, 31.5.2001, p. 1. Regulation as last amended by Commission Regulation (EC) No 2245/2003 (OJ L 133, 20.12.2003, p. 28). (3) OJ L 125, 23.5.1996, p. 10. Directive as amended by Regulation (EC) No 806/2003 (OJ L 122, 16.5.2003, p. 1). (4) Note for Official Journal: Insert No of Regulation laying down specific hygiene rules for food of animal origin (see recital 1, 2nd Regulation). (5) Note for Official Journal: Insert No of Regulation laying down specific hygiene rules for food of animal origin (see recital 1, 2nd Regulation). (6) Note for Official Journal: Insert No of Regulation laying down specific hygiene rules for food of animal origin (see recital 1, 2nd Regulation). (7) OJ L 121, 29.7.1964, p. 1977/64. Directive as last amended by Commission Regulation (EC) No 21/2004 (OJ L 5, 9.1.2004, p. 8). (8) Note for Official Journal: Insert No of Regulation laying down specific hygiene rules for food of animal origin (see recital 1, 2nd Regulation). (9) Note for Official Journal: Insert No of Regulation laying down specific hygiene rules for food of animal origin (see recital 1, 2nd Regulation). This Annex applies to live bivalve molluscs and, by analogy, to live echinoderms, live tunicates and live marine gastropods. The competent authority must fix the location and boundaries of production and relaying areas that it classifies. It may, where appropriate, do so in cooperation with the food business operator. The competent authority must classify production areas from which it authorises the harvesting of live bivalve molluscs as being of one of three categories according to the level of faecal contamination. It may, where appropriate, do so in cooperation with the food business operator. The competent authority may classify as being of Class A areas from which live bivalve molluscs may be collected for direct human consumption. Live bivalve molluscs taken from these areas must meet the health standards for live bivalve molluscs laid down in Annex III, Section VII, Chapter V, of Regulation (EC) No .../2004 (1). The competent authority may classify as being of Class B areas from which live bivalve molluscs may be collected, but placed on the market for human consumption only after treatment in a purification centre or after relaying so as to meet the health standards referred to in paragraph 3. Live bivalve molluscs from these areas must not exceed the limits of a five-tube, three dilution Most Probable Number (MPN) test of 4 600E.coli per 100 g of flesh and intravalvular liquid. The competent authority may classify as being of Class C areas from which live bivalve molluscs may be collected but placed on the market only after relaying over a long period so as to meet the health standards referred to in paragraph 3. Live bivalve molluscs from these areas must not exceed the limits of a five-tube, three dilution MPN test of 46 000 E.coli per 100 g of flesh and intravalvular liquid. establish a sampling programme of bivalve molluscs in the production area which is based on the examination of established data, and with a number of samples, a geographical distribution of the sampling points and a sampling frequency which must ensure that the results of the analysis are as representative as possible for the area considered. for the presence of chemical contaminants in live bivalve molluscs. To implement paragraph 1(b), (c) and (d), sampling plans must be drawn up providing for such checks to take place at regular intervals, or on a case-by-case basis if harvesting periods are irregular. The geographical distribution of the sampling points and the sampling frequency must ensure that the results of the analysis are as representative as possible for the area considered. the parameters referred to in paragraph 6 of Part A.
periodic toxicity tests using those molluscs from the affected area most susceptible to contamination. The sampling frequency for toxin analysis in the molluscs is, as a general rule, to be weekly during the periods at which harvesting is allowed. This frequency may be reduced in specific areas, or for specific types of molluscs, if a risk assessment on toxins or phytoplankton occurrence suggests a very low risk of toxic episodes. It is to be increased where such an assessment suggests that weekly sampling would not be sufficient. The risk assessment is to be periodically reviewed in order to assess the risk of toxins occurring in the live bivalve molluscs from these areas. When knowledge of toxin accumulation rates is available for a group of species growing in the same area, a species with the highest rate may be used as an indicator species. This will allow the exploitation of all species in the group if toxin levels in the indicator species are below the regulatory limits. When toxin levels in the indicator species are above the regulatory limits, harvesting of the other species is only to be allowed if further analysis on the other species shows toxin levels below the limits. With regard to the monitoring of plankton, the samples are to be representative of the water column and to provide information on the presence of toxic species as well as on population trends. If any changes in toxic populations that may lead to toxin accumulation are detected, the sampling frequency of molluscs is to be increased or precautionary closures of the areas are to be established until results of toxin analysis are obtained. Sampling plans to check for the presence of chemical contaminants must enable the detection of any overshooting of the levels laid down in Commission Regulation (EC) No 466/2001 (2). Where the results of sampling show that the health standards for molluscs are exceeded, or that there may be otherwise a risk to human health, the competent authority must close the production area concerned, preventing the harvesting of live bivalve molluscs. However, the competent authority may reclassify a production area as being of Class B or C if it meets the relevant criteria set out in Part A and presents no other risk to human health. The competent authority may re-open a closed production area only if the health standards for molluscs once again comply with Community legislation. If the competent authority closes a production because of the presence of plankton or excessive levels of toxins in molluscs, at least two consecutive results below the regulatory limit separated at least 48 hours are necessary to re-open it. The competent authority may take account of information on phytoplankton trends when taking this decision. When there are robust data on the dynamic of the toxicity for a given area, and provided that recent data on decreasing trends of toxicity are available, the competent authority may decide to re-open the area with results below the regulatory limit obtained from one single sampling. The competent authority is to monitor classified production areas from which it has forbidden the harvesting of bivalve molluscs or subjected harvesting to special, conditions, to ensure that products harmful to human health are not placed on the market. In addition to the monitoring of relaying and production zones referred to in paragraph 1 of Part B, a control system must be set up comprising laboratory tests to verify food business operators' compliance with the requirements for the end product at all stages of production, processing and distribution. This control system is, in particular, to Verify that the levels of marine biotoxins and contaminants do not exceed safety limits and that the microbiological quality of the molluscs does not constitute a hazard to human health. act promptly where the controls prescribed in this Annex indicate that a production area must be closed or reclassified or can be re-opened. To decide on the classification, opening or closure of production areas, the competent authority may take into account the results of controls that food business operators or organisations representing food business operators have carried out. In that event, the competent authority must have designated the laboratory carrying out the analysis and, if necessary, sampling and analysis must have taken place in accordance with a protocol that the competent authority and the food business operators or organisation concerned have agreed. Official controls on pectinidae harvested outside classified production areas are to be carried out in fish auctions, dispatch centres and processing establishments. Such official controls are to verify compliance with the health standards for live bivalve molluscs laid down in Annex III, Section VII, Chapter V, to Regulation (EC) No .../2004 (3) as well as compliance with other requirements of Annex III, Section VII, Chapter IX, to that Regulation. (2) OJ L 77, 16.3.2001, p. 1. Regulation as last amended by Regulation (EC) No 655/2004 (OJ L 104, 8.4.2004, p. 48). (3) Note for Official Journal: Insert No of Regulation laying down specific hygiene rules for food of animal origin (see recital 1, 2nd Regulation). checks on storage and transport conditions. may, if necessary, when the competent authority of the Member State the flag of which the vessel is flying carries out the official control, be carried out while the vessel is at sea or when it is in a port in another Member State or in a third country. In the case of an inspection of a factory or freezer vessel flying the flag of a Member State carried out with a view to the approval of the vessel, the competent authority of the Member State the flag of which the vessel is flying is to carry out inspections in such a manner as to comply with the requirements of Article 3, particularly the time limits of Article 3(2). If necessary, that competent authority may inspect the vessel while it is at sea or when it is in a port in another Member State or in a third country. a third Country that appears on a list of third countries from which imports of fishery products are permitted drawn up in accordance with Article 11, to carry out a follow-up inspection with a view to granting full approval or prolonging conditional approval in accordance with Article 3(1)(b) or to keeping approval under review in accordance with Article 3(4). If necessary, that competent authority may inspect the vessel while it is at sea or when it is in a port in another Member State or in a third country. When the competent authority of a Member State authorises the competent authority of another Member State or of a third country to carry out inspections on its behalf in accordance with paragraph 3, the two competent authorities are to agree on the conditions governing such inspections. These conditions are to ensure, in particular, that the competent authority of the Member State the flag of which the vessel is flying receives reports on the results of inspections and on any suspected non-compliance without delay, so as to enable it to take the necessary measures. Official controls of fishery products are to include at least the following elements. Random organoleptic checks must be carried out at all stages of production, processing and distribution. One aim of these checks is to verify compliance with the freshness criteria established in accordance with Community legislation. In particular, this includes verifying, at all stages of production, processing and distribution, that fishery products at least exceed the baselines of freshness criteria established in accordance with Community legislation. When the organoleptic examination reveals any doubt as to the freshness of the fishery products, samples may be taken and subjected to laboratory tests to determine the levels of total volatile basic nitrogen (TVB-N) and trimethylamine nitrogen (TMA-N). The competent authority is to use the criteria laid down under Community legislation. When the organoleptic examination gives cause to suspect the presence of other conditions which may affect human health, appropriate samples are to be taken for verification purposes. Random testing for histamine is to be carried out to verify compliance with the permitted levels laid down under Community legislation. Monitoring arrangements are to be set up to control the levels of residues and contaminants in accordance with Community legislation. Where necessary, microbiological checks are to be performed in accordance with the relevant rules and criteria laid down under Community legislation. Random testing is to take place to verify compliance with Community legislation on parasites. fishery products containing biotoxins such as Ciguatera or other toxins dangerous to human health. However, fishery products derived from bivalve molluscs, echinoderms, tunicates and marine gastropods may be placed on the market if they have been produced in accordance with Section VII of Annex III to Regulation (EC) No .../2004 (1) and comply with the standards laid down in Chapter V, point 2, of that Section. the competent authority considers that they may constitute a risk to public or animal health or are for any other reason not suitable for human consumption. (2) Note for Official Journal: Insert No of Regulation laying down specific hygiene rules for food of animal origin (see recital 1, 2nd Regulation). Animals on milk production holdings must be subject to official controls to verify that the health requirements for raw milk production, and in particular the health status of the animals and the use of veterinary medicinal products, are being complied with. These controls may take place at the occasion of veterinary checks carried out pursuant to Community provisions on animal or public health or animal welfare and may be carried out by an approved veterinarian. If there are grounds for suspecting that the animal health requirements are not being complied with, the general health status of the animals is to be checked. Milk production holdings are to undergo official controls to verify that hygiene requirements are being complied with. These official controls may involve inspections and/or the monitoring of controls that professional organisations carry out. If it is shown that the hygiene is inadequate, the competent authority is to verify that appropriate steps are taken to correct the situation. The competent authority is to monitor the checks carried out in accordance with Annex III, Section LX, Chapter I, Part III, to Regulation (EC) No .../2004 (1). If the food business operator has not corrected the situation within three months of first notifying the competent authority of non-compliance with the criteria with regard to plate count and somatic cell count, delivery of raw milk from the production holding is to be suspended or - in accordance with a specific authorisation of, or general instructions from, the competent authority - subjected to requirements concerning its treatment and use necessary to protect public health. This suspension or these requirements are to remain in place until the food business operator has proved that the raw milk again complies with the criteria. establishments carrying out only the storage of products of animal origin not requiring temperature-controlled storage conditions. The representative of the competent authority of the third country of dispatch issuing a certificate to accompany a consignment of products of animal origin destined for the Community must sign the certificate and ensure that it bears an official stamp. This requirement applies to each sheet of the certificate if it consists of more than one. In the case of factory vessels, the competent authority may authorise the captain or another ship's officer to sign the certificate. Certificates must be drawn up in the official language or languages of the third country of dispatch and the Member State in which the border inspection takes place, or be accompanied by a certified translation into that language or languages. If the Member State of destination so requests, certificates must also be accompanied by a certified translation into the official language or languages of that Member State. However, a Member State may consent to the use of an official Community language other than its own. The original version of the certificate must accompany consignments on entry into the Community. a sequence of pages numbered so as to indicate that it is a particular page in a finite sequence (for example, “page 2 of 4 pages”). Certificates must bear a unique identifying number. Where the certificate consists of a sequence of pages, each page must indicate this number. The certificate must be issued before the consignment to which it relates leaves the control of the competent authority of the third country of dispatch.